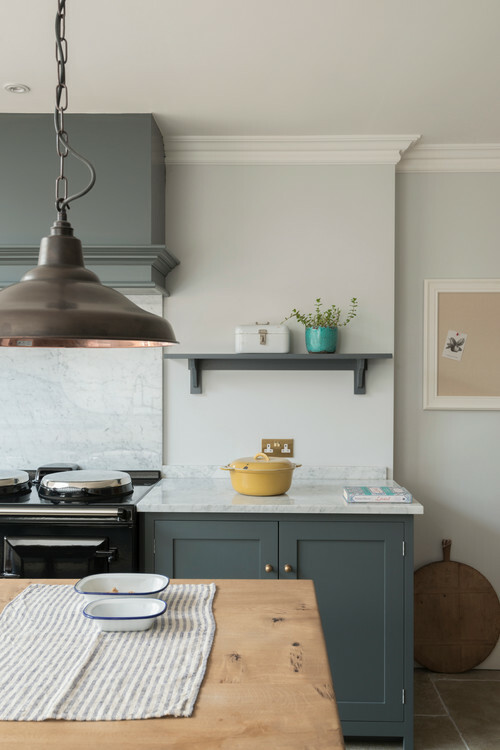 Country Style Kitchens from the U.K. 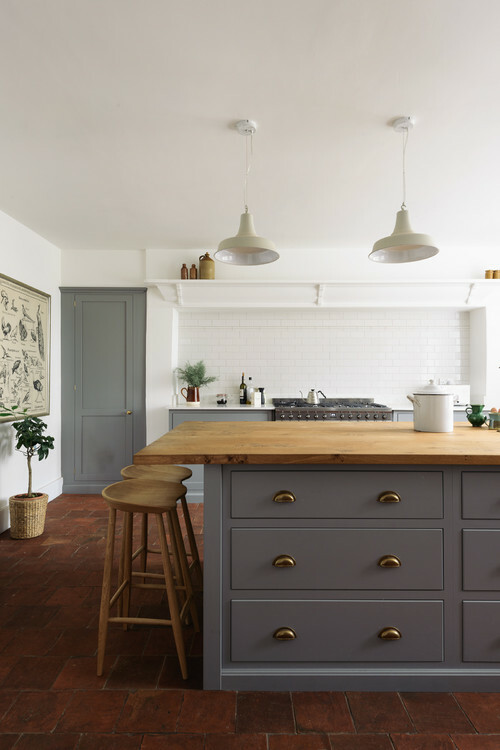 I was recently surfing through Houzz, one of my favorite home decor sites, and stumbled across the most beautiful country style kitchens. 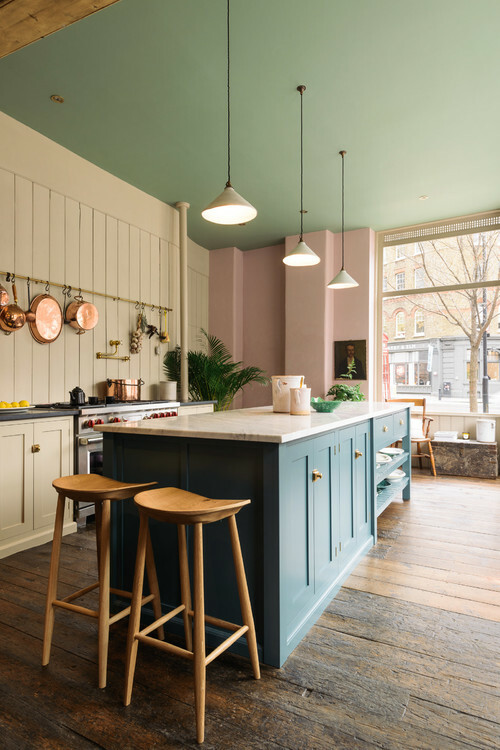 They were all by deVOL Kitchens located in the United Kingdom. 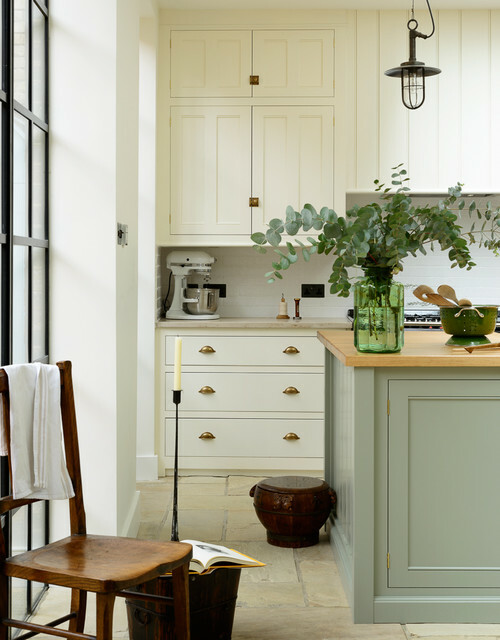 You’ll find the strong influence of Shaker design in these simple yet amazing kitchens. 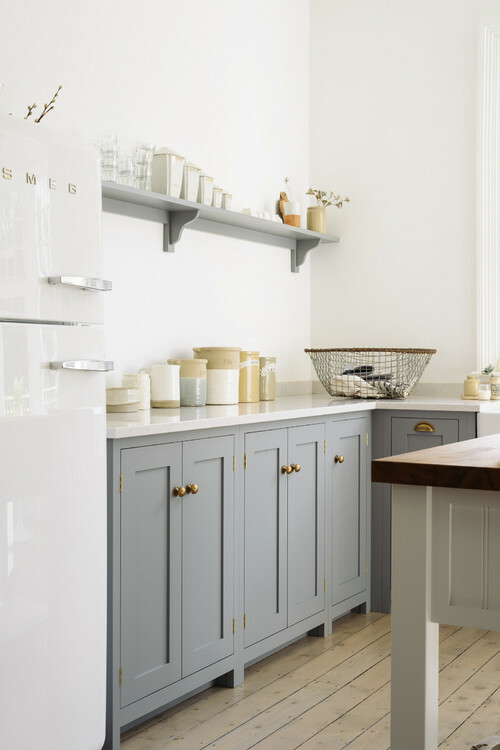 Clean classic lines are seen in all of the country style kitchens in today’s post. 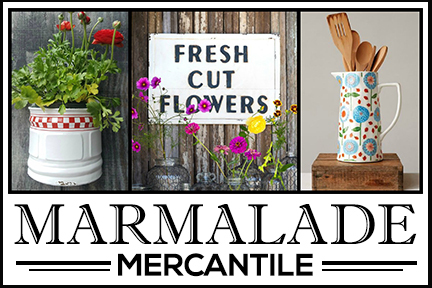 You’ll also find farmhouse touches that keep the heart of the home charming, comfortable, and very livable. In the United Kingdom, they use the word “bespoke” to define something that’s custom made. 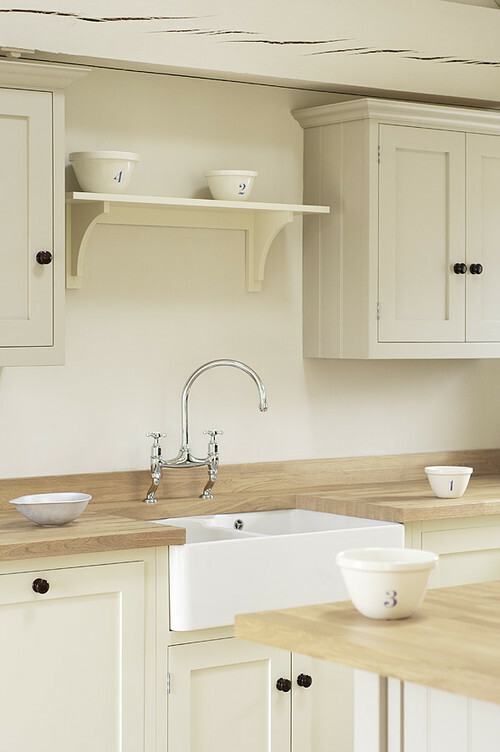 Sometimes custom cabinetry can look a bit fussy, but deVOL Kitchens keep the lines clean and classic. 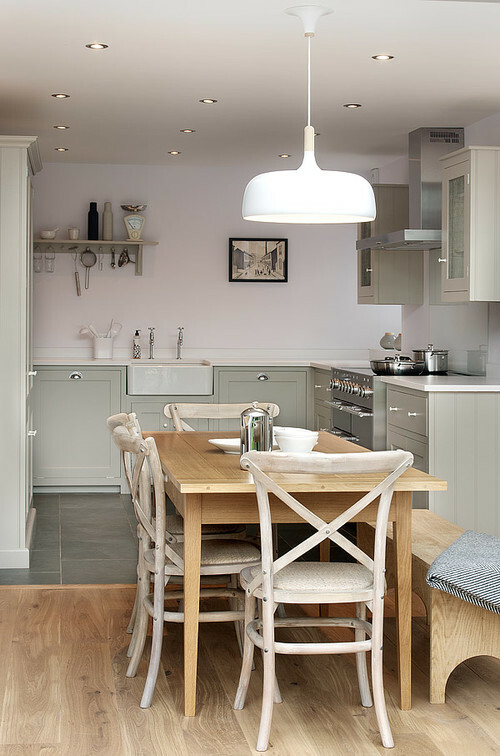 Although a lot of the country kitchens in today’s post use soft colors, you’ll find a few rooms with bolder colors. 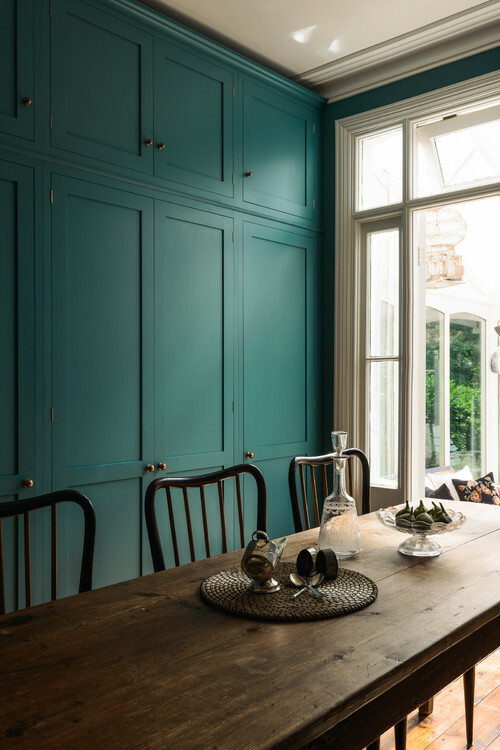 I think this deep teal looks beautiful as a backdrop to the rich wood farmhouse table and chairs. In addition to the gorgeous cabinets in each of these country style kitchens, I also love the floors. The first one shown was brick, the next two were wood, and this one is beautiful stone. I know marble and granite are popular choices for counter tops, but I love the warmth and organic feel of wood counter tops as seen in this kitchen. Note the custom crown work at the ceiling. 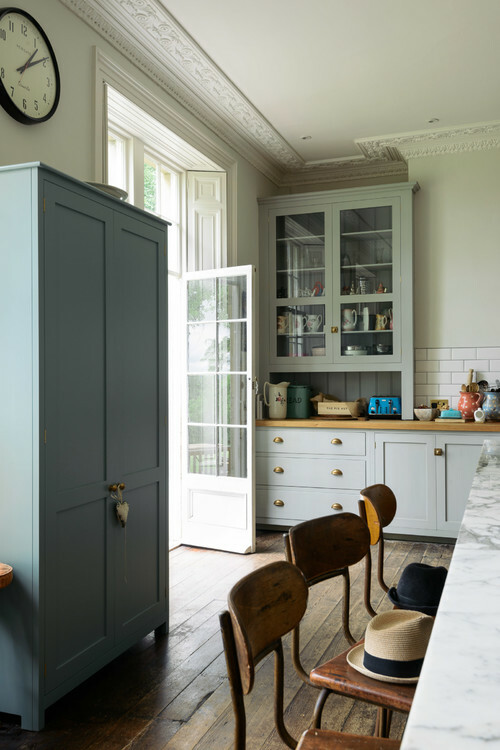 deVOL Kitchens also carry a line of unique ranges that pair beautiful with their cabinetry. 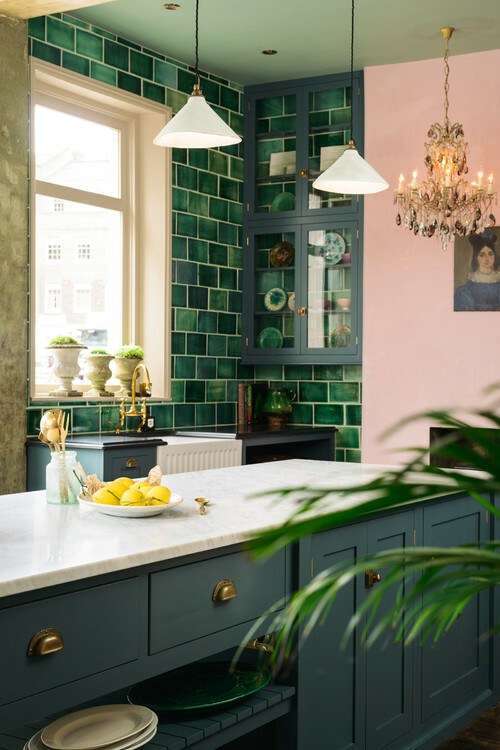 If you’re a fan of color, you might appreciate the green and blue hues in this kitchen at their showroom St. John’s Square Showroom. I don’t know if you’re familiar with Smeg appliances, but I’ve loved their retro-style refrigerators ever since I first saw them. 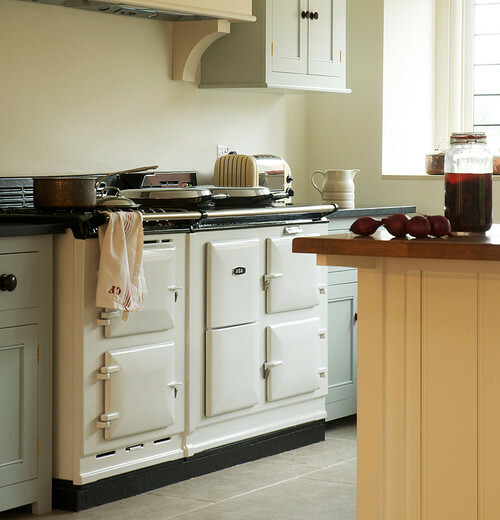 They fit well with farmhouse and vintage kitchens. 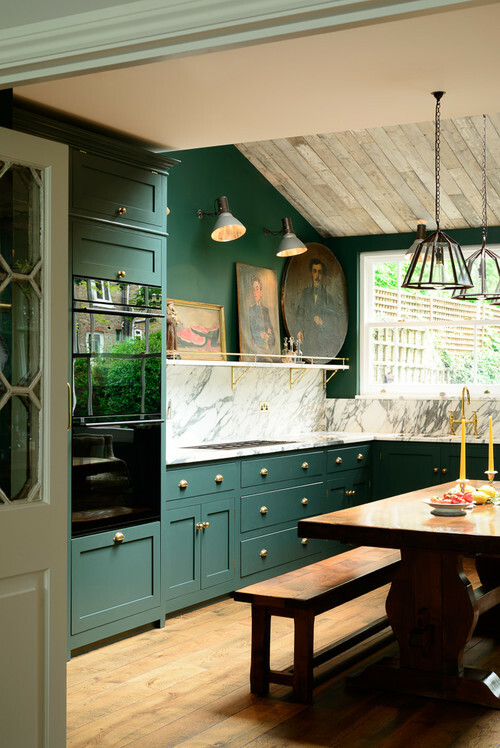 Here’s another deVOL Kitchen as seen in their showroom. 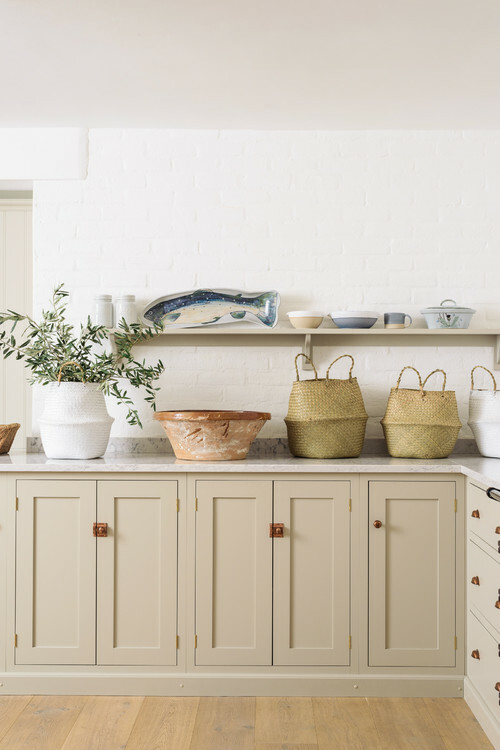 The organic baskets and pottery pieces look great in country style kitchens. I love the cabinet latches, too. 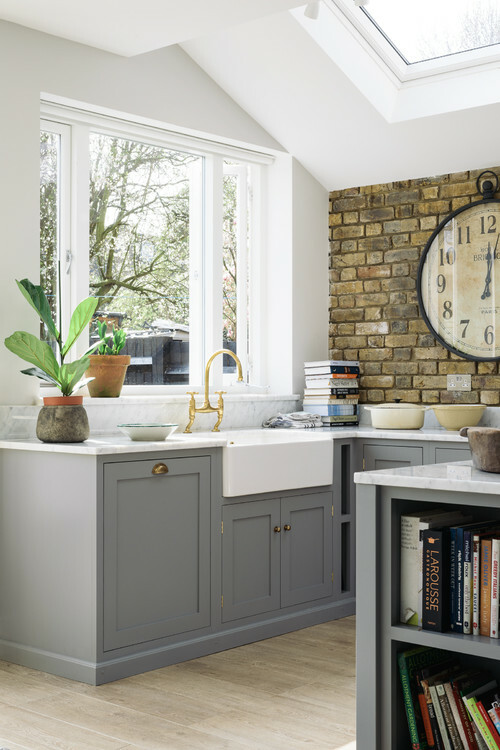 An oversized clock looks great on the brick wall of this fresh-looking kitchen. Another pretty kitchen with deep tones and rich woods. This kitchen has farmhouse style written all over it. 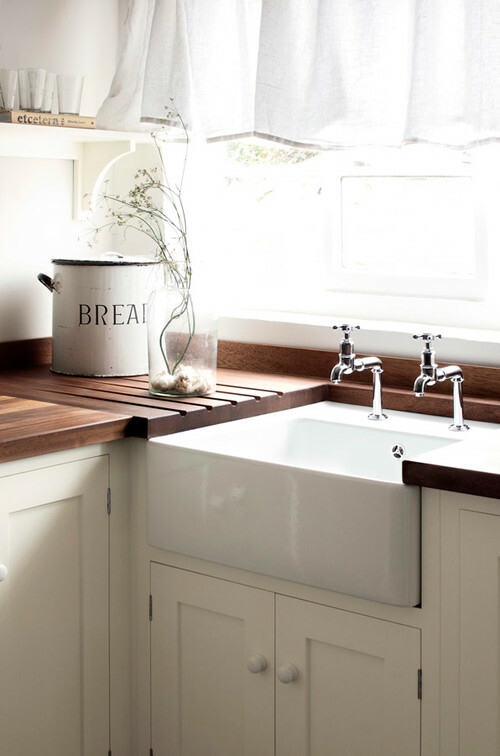 From the simple window valance to the apron sink to the vintage bread tin, it’s truly charming. 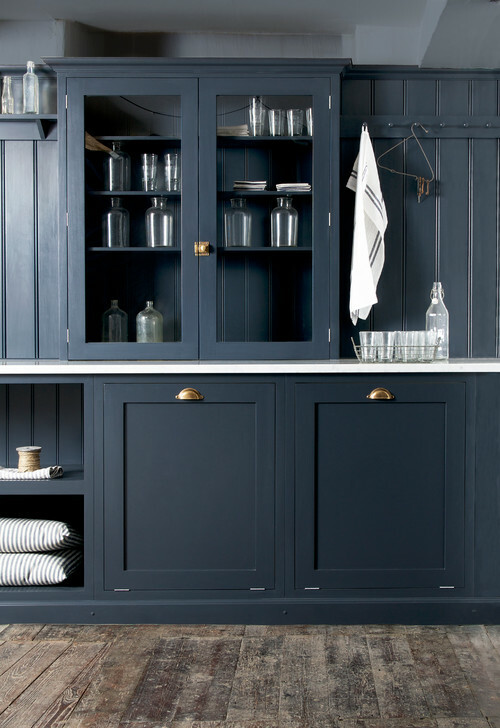 The color paint in this room is called “pantry blue.” Perfect! It looks great with the worn, wood floors. Cross-back dining chairs are very popular these days and it’s easy to see why. They look great in country style kitchens. 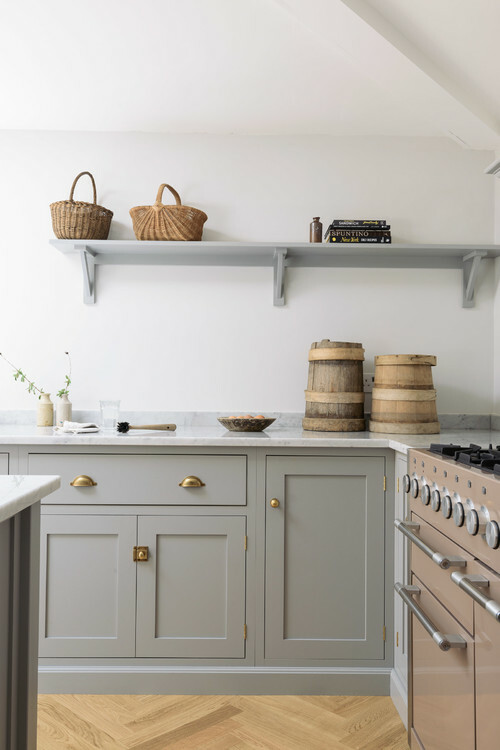 Open shelves are always a sign of a farmhouse or country kitchen. I can’t decide which I like better, the kitchens with soft colors or darker colors. They’re both beautiful in their own way. 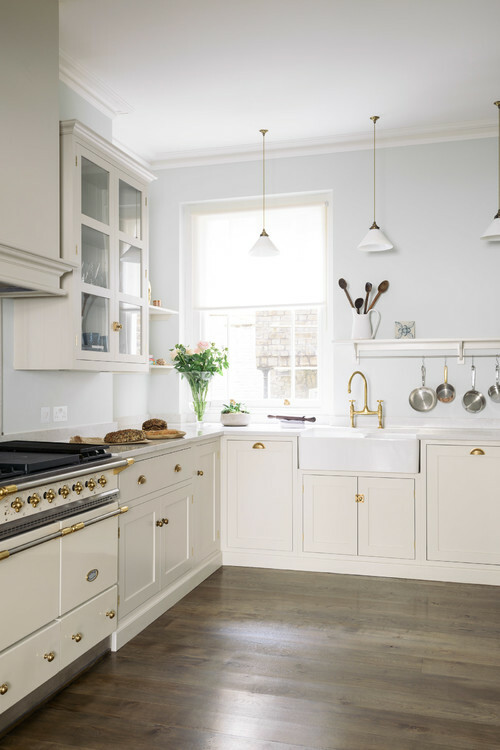 I truly hope you enjoyed this collection of deVOL country style kitchens. You can see even more of these fantastic rooms at Houzz or on their website. It’s interesting how they don’t feel the need to fill their walls. It’s refreshing! I really wish you would make it possible to individually pin each picture onto our Pinterest boards. 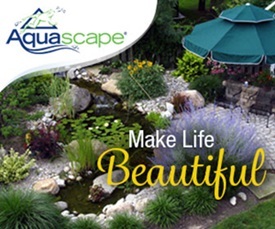 Houzz pics are not pinable. If I want to pin something I’ve seen on Houzz, I check to see if the architect / builder / designer has their own web page. Usually, the pictures are pinable directly from that site. 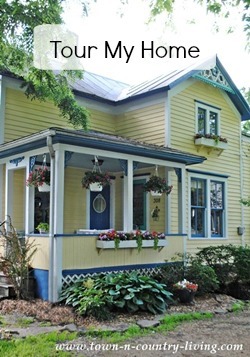 Houzz also has a way to save pictures you like in your own Houzz idea book. These great kitchens make you want to change something in yours. My favorite photo is the tall teal cabinets with the beautiful wood farm table. I love dark colors in a kitchen when there are ceilings high enough to handle the lack of light at head level. I want wood countertops. I don’t care what anybody says…I want them and Lord willing, I will get them sometime next year! I love their work! I daydream about how I wish they were in the U.S. and I could use them to create one of these beautiful kitchens for me. 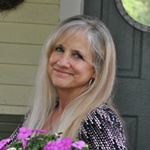 I discovered them a while back and I can’t recall if it was through your blog or not but I liked them on Facebook and now I get updates on their projects. They offer very simple, classic, and elegant designs / cabinetry. I am short so I don’t find wall cabinets useful! My kitchen only has just one. Thanks for sharing.